Transfer (not included) from the ship via launch to St. Mark's Square, where you begin your adventure on foot. Piazza San Marco - You will be guided through the very heart of Venice, as your knowledgeable guide points out the city's landmarks, including the Doge's Palace, St. Mark's Basilica, the Campanile and the many arcaded buildings around the square. St. Mark's Basilica - Venice's basilica is a testament to Byzantium's influence on Venice. Included features are gold mosaic arches rising above the carved, Romanesque portal and the rooftop is bedecked with five domes, reminiscent of St. Sophia in today's Istanbul. Your guide points out the basilica's features before you enter; guides are not allowed to narrate while visiting the interior. Then join the entry line. The basilica's interior features marble floors and walls that blend in exquisite, carpet-like patterns. Gilded mosaic murals, like icons, adorn the walls. Doge's Palace - Residence of the Doge and Venice's seat of government the Palace was the example of the Republic's maritime and commercial power. The ornate facade features an arcaded loggia, and your interior tour takes in the famous Golden Staircase, the Great Council Chamber, other historic rooms, and paintings by Tintoretto and Veronese. 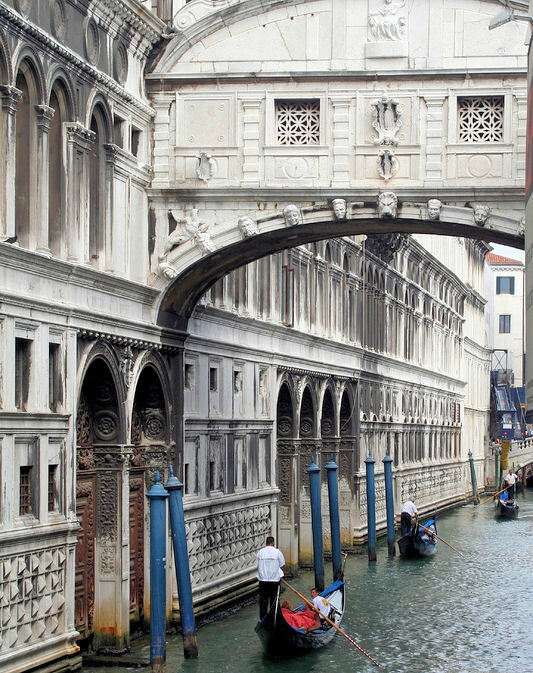 Bridge of Sighs - Cross the 17th-century covered stone bridge that is one of Venice's most photographed landmarks. The bridge links the Doge's Palace with the old prison dungeons.